Conner Miller carries an American flag as he crosses the finish line of the Firecracker 5K on Saturday morning in Ansonia. ANSONIA – The 32nd annual Ansonia Firecracker 5K had 14 more runners and walkers than last year as the race drew 363 people to compete Saturday morning in Ansonia. The race, which is a fundraiser for the Ansonia Fire Department, also had five new sponsors this year. The competition started on Ohio 47 in front of Ansonia Local Schools and ended on the west side of the school. Two runners – Bill Haber of Greenville and Jerry Monnin of Versailles – continued their streaks of running in the Firecracker 5K for the 32nd consecutive year. Race Director John Snyder was happy with the turnout for the Fourth of July race, especially considering Celina, Fort Loramie, St. Henry and Tipp City all have started races during the same weekend. Ansonia’s race was sponsored by the Ansonia Fire Department, Greenville National Bank, Riffle Mowing and Landscaping, Cal-Maine Foods Inc., Pressure It! Power Washing LLC, Versailles Painting Service LLC., Soil Enrichment Haulers Inc., Nate’s Mowing & Landscaping, Midlam Automotive and Ansonia Lumber Company in conjunction with the Ansonia Fourth of July celebration. The Ansonia Police Department, Ansonia Rescue Squad and Ansonia Schools also supplied support for the event, which is part of the Darke County Wellness Challenge. Calen Bruner was the overall winner of the race with a time of 16:46.0. Bailey Hartle finished second in 17:34.3, and Isaac Stephens finished third in 17:43.0. Julie Mattheis was the top female finisher in a time of 20.48.1. Holly Fiora finished second in 20:55.0, and Tracy Cessna finished third in 21:21.7. Mya Conway won the girls 10 and younger race in 31:16.5, Montana Pulfer finished second in 33:21.9, and Isabella Smith finished third in 40:33.0. Lauren Hemmelgarn won the girls 11 to 14 division in 22:03.2, Hannah Bruns finished second in 22:35.2, and Ashley Bruns finished third in 22:51.4. Tami Groff won the girls 15 to 19 division in 21:27.7, Olivia Hemmelgarn finished second in 22:02.0, and Anna Fiessinger finished third in 22:03.4. Erin Hoening won the women’s 20 to 24 division with a time of 26:20.2, Ivana Martinez finished second in 29:40.1, and Cassidy Brunk finished third in 32.06.1. Emily Bey won the women’s 25 to 29 division in a time of 27.59.5, Allison Geise finished second in 28:04.8, and Laura Moore finished third in 29:35.3. Kara Warren won the women’s 30 to 34 division in 22:13.0, Catie Topp finished second in 23:03.8, and Amber Neal finished third in 24:06.8. Jennifer Warner won the women’s 35 to 39 division in a time of 23:09.4, Kati Stephens finished second in 25:38.6, and Theresa Treadway finished third in 26:24.8. Carolyn Iddings won the women’s 40 to 44 division with a time of 22:01.5, Crystal Barton finished second in 22:27.4, and Kitty Zumbrink finished third in 23:53.0. Jeanna Homan won the women’s 45 to 49 division in 24:33.0, Amy Brandt finished second in 26:28.6, and Patty Sutter finished third in 27:45.7. Shelly Haber won the women’s 50 to 54 division in 23:47.6, Tammy Holley finished second in 28:16.5, and Deb Loewer finished third in 28:55.0. Susan Fowble won the women’s 60 to 64 division in 29:31.6, Teresa Clark finished second in 32:59.1, and Vicki Wiltshire finished third in 36:19.8. Rebecca Shumaker won the women’s 65 to 69 division with a time of 29:35.6, and Mary Saintignon finished second in 32:29.7. Marilyn Sowers won the women’s 70 and older division in a time of 41:06.0. Mason Pierri won the boys 10 and younger division in 27:32.6, Colin Moody finished second in 28:43.1, and Dylan Riffell finished third in 32:55.3. Logan Warner won the boys 11 to 14 division in a time of 20:59.7, Jared Hoying finished second in 22:01.4, and Dalton Marker finished third in 23:11.2. Kessler Fisher won the boys 15 to 19 division with a time of 17:47.8, Gabe Beatty finished second in 17:57.2, and Conner Miller finished third in 18:10.6. Austin Bergman won the men’s 20 to 24 division in 21:13.9, Ethan Hoening finished second in 21:15.1, and Landon Bruner finished third in 22:33.2. Jansen Hein won the men’s 25 to 29 division in a time of 18:01.1, Aaron Fraley finished second in 18:46.8, and Jordan Francis finished third in 26:20.7. Chad Topp won the men’s 30 to 34 division in a time of 19:01.4, Scott Meinardi finished second in 19:20.5, and Bruce Burns finished third in 20:11.1. Justin Marshall won the men’s 35 to 39 division in 20:12.3, Chris Warner finished second in 21:22.8, and Jason Marker finished third in 22:40.4. Jaramie Stevens won the men’s 40 to 44 division with a time of 22:47.7, Mark Thomas finished second in 26:57.2, and Brad Gettinger finished third in 27:40.1. Roy Helms won the men’s 45 to 49 division in 18:10.0, Todd Miller finished second in 20:38.5, and John Unger finished third in 21:29.6. Dan Homan won the men’s 50 to 54 division with a time of 20:40.9, Dan Young finished second in 21:18.5, and Bill Haber finished third in 21:37.6. Rick Moody won the men’s 55 to 59 division in 20:36.8, Mark Barton finished second in 21:37.9, and Jon Hein finished third in 22:24.3. Richard Barton won the men’s 60 to 64 division in a time of 22:11.7, Ivan Steinke finished second in 26:26.1, and Randy Clune finished third in 26:26.4. Ron Griffitts won the men’s 65 to 69 division in 26:45.0, Randy Bashore finished second in 27:09.4, and Patrick Barga finished third in 36:46.6. George Sowers won the men’s 70 and older division in 33:41.5, Walter Bruchey finished second in 47:45.5, and Jerry Monnin finished third in 49:04.4. For complete results from the Firecracker 5K, visit goodtimesraces.com. 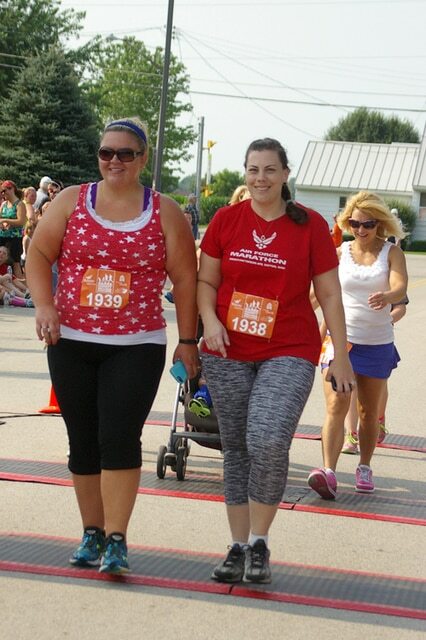 The 33rd annual Ansonia Firecracker 5K is scheduled for July 4, 2016, which will be a Monday.